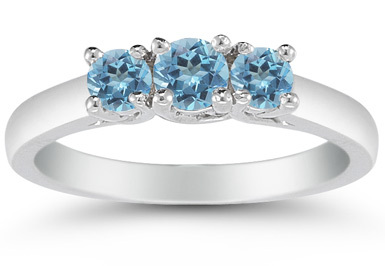 Even the bluest summer sky can't compete with the radiance of this blue topaz three stone ring. Apples of Gold ensures this ring gives your jewelry collection a resplendent makeover with three high quality blue topaz gemstones. The middle gem measures 4mm while the side blue topaz stones are 3.5mm, to achieve the right amount of blue hue. Each gemstone is set with four prongs of white gold to hold the precious stones in place over the buffed white gold band. We guarantee our Three Stone Blue Topaz Ring, 14K White Gold to be high quality, authentic jewelry, as described above.